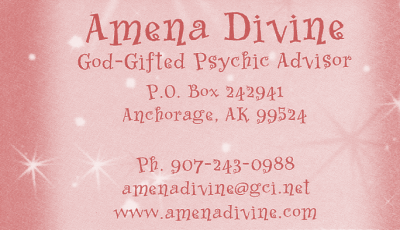 If you're interested in a personal reading call Amena today at 907-243-0988! 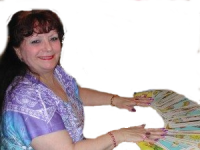 Let her answers questions about you, loved ones, careers, past and future relationships, finances, luck, and more. If Amena is unable to answer please leave your name and telephone number with area code, Amena returns all calls so please be a little patient, some days are very busy. Amena also offers additional services via snail mail. Click here to visit Amena's service page to see what other services you may be interested in. If you're interested in a reading for your pet please visit her pet reading website at: http://www.purrfectpawspetreadings.com/ for more information. If you have any questions, please do not hesitate to contact Amena by e-mail at [email protected] Amena loves to hear your feedback and concerns and will respond to you within 5-7 business days. You can also write to Amena via standard mail. Please allow 2-3 weeks for returned delivery. Must be 18 years or older to call. Adult entertainment only.